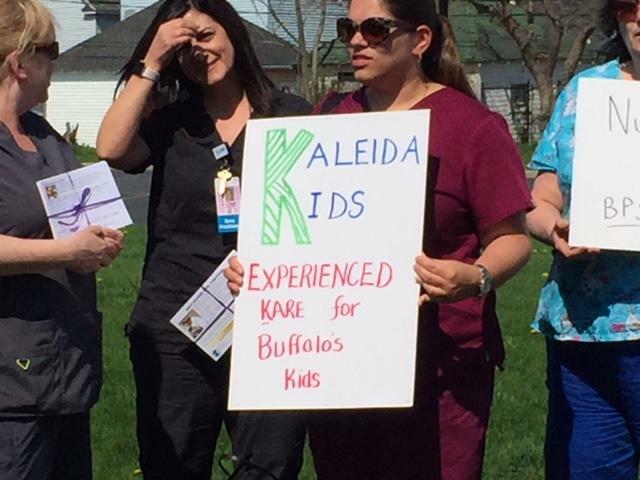 It is increasingly likely that 70 Kaleida Health registered nurses and LPNs will not be in Buffalo Public Schools after this school year. 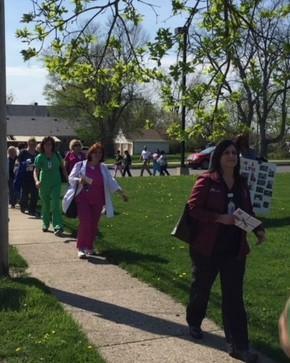 The school district praises their work, but cannot ignore that Kaleida filed its bid to keep the nurses in the schools minutes after the deadline. 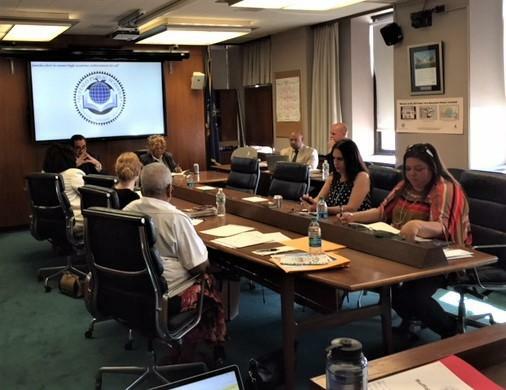 School Board General Counsel Nathaniel Kuzma said Kaleida's response to an RFP for nursing staff came in 16 minutes after the January 4 deadline and legally he cannot waive that delay without facing a lawsuit from other bidders. "The responsibility and the accountability really rests with Kaleida here and they owe those nurses an apology<' Kuzma said, "and we're disappointed at what they are trying to do and to force the district's hand based on a past relationship and asking us to look the other way which in our view would be unethical. It would be illegal and we would certainly face challenges from the other vendors that played by the rules." 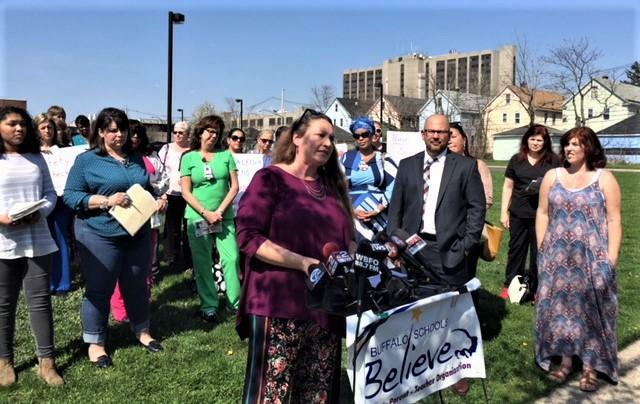 The nurses showed up for a news conference Wednesday sponsored by the Buffalo Parent Teacher Organization. It was held on the property line of School 89, the Dr. Lydia T. Wright School of Excellence on Appenheimer Avenue, after school district personnel said it could not be held on school property. Parents and nurses talked about how they love the care provided. Parent Ti Markle praised the work of nurse Patricia Marvine at Bennett Park Montessori. "We have kids in our school that also require feeding tubes three times a day," Markle said. "Also, Anna Skinner's children wouldn't feel comfortable going on field trips if they didn't have Nurse Pat with them. They wouldn't want to go with a stranger. She and all the nurses here really put in so much extra effort, dedication and compassion for these kids. They really know these kids." In a city of kids with many needs, the nurses are the MASH unit of the school district. Kaleida spokesman Michael Hughes said the school district needs to better explain better what is going on to the unhappy nurses. "They're outraged and understandably," Hughes said. "We've admitted we hold ourselves accountable for the error in the bid, but the school district waited months months to respond to us, to tell us they are not accepting our bid. 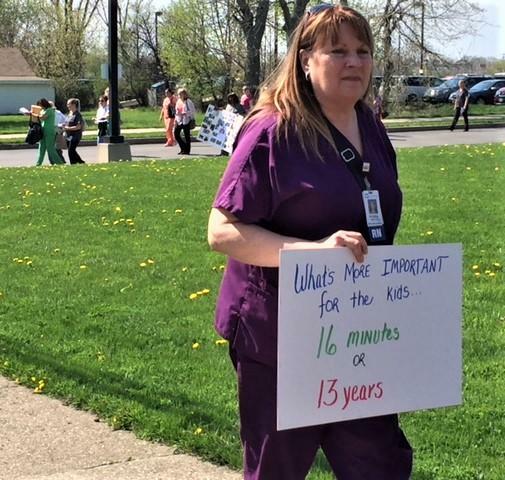 These nurses and the kids deserve answers. Why has it taken four months? Is it a cost issue? Is it an anti-union issue? What is the reason for the delay? Why are they telling us just now?" Hughes said says 16 minutes should not negate the 13 years the nurses have worked in city schools. Two other applicants were also disqualified for filing late, while 10 filed on time. The nurses have been told they can be hired for other Kaleida posts. It is not clear who will provide the care in city schools come September. WBFO News photo by Mike Desmond. 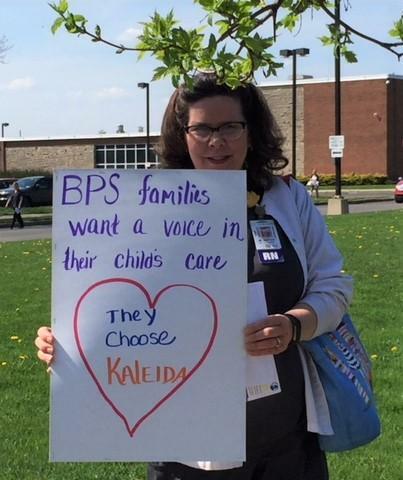 Buffalo Public Schools are rushing to extend the Kaleida Health contract that provides nurses for all regular public, private, parochial and charter schools. WBFO's Mike Desmond reports.